The Voice newspaper is asking students, currently enrolled in schools across the UK, to submit a 500-word article explaining what black history means to them. The winning entry, selected by an independent panel from the community, will be published in The Voice newspaper alongside a picture of the author, who will also receive a gift voucher to the value of £50. 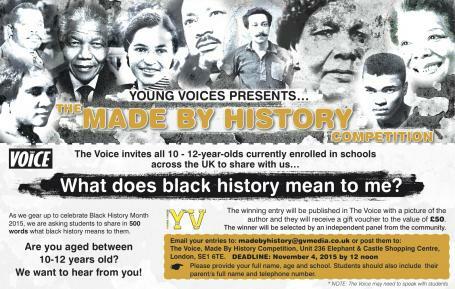 Please email to madebyhistory@gvmedia.co.uk or post to: The Voice, Made By History Competition, Unit 236, Elephant & Castle Shopping Centre, London, SE1 6TE. The deadline for all entries is November 4, 2015, at 12 noon. If this competition is of interest, please share, distribute and encourage all 10-12 year olds who fit the criteria to enter.